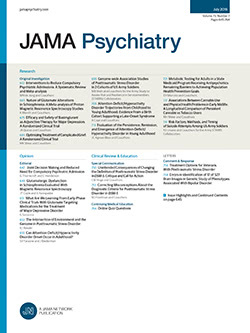 In the editorial titled “The Striatum and Dopamine: A Crossroad of Risk for Schizophrenia” published online in the March 12, 2014, issue of JAMA Psychiatry (2014;71: doi:10.1001/jamapsychiatry.2014.191), an academic degree was missing. Guillermo Horga’s degree should have been listed as MD. Also, the second and third sentences in the third paragraph, which read, “First, the blood oxygen level–dependent signals reflect more closely presynaptic activity than postsynaptic spiking2 and the evidence implicating firing patterns of dopamine neurons in signaling motivational value and salience. Given that, the blood oxygen level–dependent signal in the ventral striatum may arise from the input signal from dopaminergic neurons located in the midbrain rather than from striatal neurons,” should be replaced by, “First, given that blood oxygen level–dependent signals reflect more closely presynaptic activity than postsynaptic spiking2 and the evidence implicating firing patterns of dopamine neurons in signaling motivational value and salience, the blood oxygen level–dependent signal in the ventral striatum may arise from the input signal from dopaminergic neurons located in the midbrain rather than from striatal neurons.” This article was corrected online.